UNITED STATES: The Maryland legislature has passed the Clean Energy Jobs act, overriding a veto by Governor Larry Hogan. The act increases the state's renewable portfolio standard to 25% by 2020 — up from the previous target of 20%. 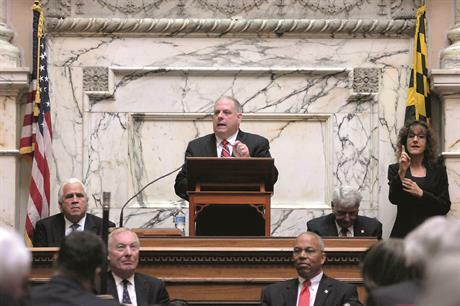 Both Maryland's Senate and House of Delegates voted to push the legislation through this week. The American Wind Energy Association (AWEA) welcomed the veto override: "Making the Clean Energy Jobs act law is the right decision for Maryland. Renewable energy legislation is pro-growth, pro-business, and means access to more jobs in Maryland," said AWEA CEO Tom Kiernan. According to AWEA, Oregon, New York, Massachusetts, Michigan, Rhode Island, and Washington DC — equal to roughly a quarter of the US population — have chosen to raise their renewable energy goals over the past year while adding jobs and investment. California, Oregon, New York and Hawaii have standards aiming for 50% renewable energy and beyond.